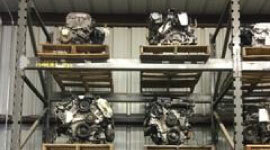 The Best Used Auto Parts In West Texas! Stop in today and find the high quality auto parts you need! Citron's Used Auto Parts has provided high quality recycled auto parts throughout the United States while delivering outstanding customer satisfaction. With over 24 acres of hard to find used quality auto and truck parts to chose from, you're sure to find the high quality auto parts you need! With over 35 years of experience in selling dependable used auto parts, the owner is here to make sure you get the right parts at the right prices. Shop for your parts online, stop in & let one of our Automotive Professionals help you, or give us a call and we’ll be happy to locate the parts you're looking for! At Citron’s, we’re dedicated to keeping our inventory stocked with high quality auto parts, keeping our prices low, and keeping our customers happy. We specialize in all late model automobiles and light pick ups. We also carry a large selection of foreign vehicles. Stop in and see why we’re Odessa’s Home for Auto Parts!